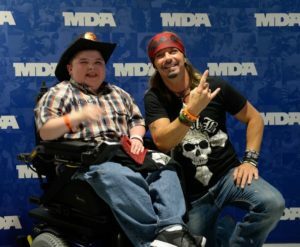 What Does the MDA Do? Families are at the heart of MDA’s mission. A caring and concerned group of families started MDA in 1950, and we continue to relentlessly pursue our promise to free families from the life-threatening effects of muscular dystrophy and muscle-debilitating diseases today. MDA takes a big-picture perspective across neuromuscular diseases to uncover breakthroughs that will accelerate treatments and cures. The power in this research approach is that knowledge and information from one disease can often yield progress in others to speed urgently needed answers for families. The freedom to walk, to talk, to run and play. To laugh, to hug. To eat. To breathe. Each day across the country, these everyday freedoms are taken away from kids and adults with muscular dystrophy, ALS and related diseases that weaken muscle strength and severely limit mobility. You can change that. Together, we can free families from the harm of these devastating diseases so they can live unlimited. If you would like additional information on how you can help raise money for the MDA of CT, and receive a free ticket to the 5th Annual MDA Benefit Ride and Concert, please fill out the form on the contact page and we will let you know where to pick up a fundraising envelope. Join our benefit ride to save and improve the lives of these courageous families.